Monbazillac is a small village a few kilometres south of Bergerac in the Dordogne department of France. 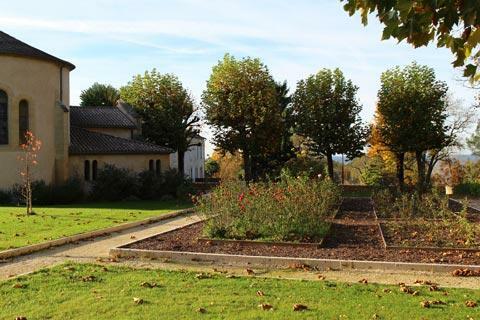 The village is pleasant, if very small, and would probably go unnoticed if it wasn't for the imposing Château de Monbazillac on the edge of the village and the famous wines produced here. 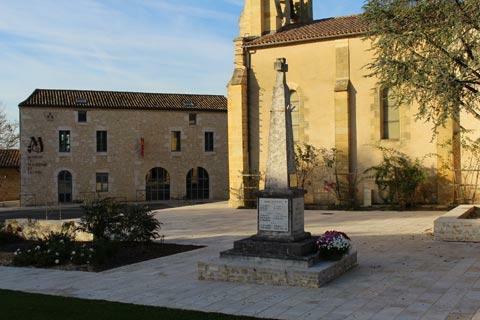 It is probably more accurate to describe Monbazillac itself as a hamlet: apart from the church in the centre of the village you will find a tourist Office and a Maison des Vins and a few houses but very little else. The castle is on the northern edge of the village. There is a large car park in the woods, which are very pretty and have plenty of space for a picnic, and the castle is then reached down a long straight path with vineyards and plants along both sides. 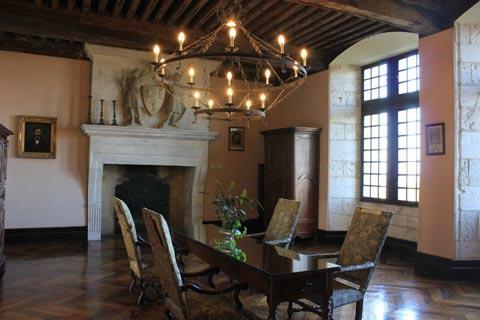 The castle dates from the 16th century, and is in the renaissance style. 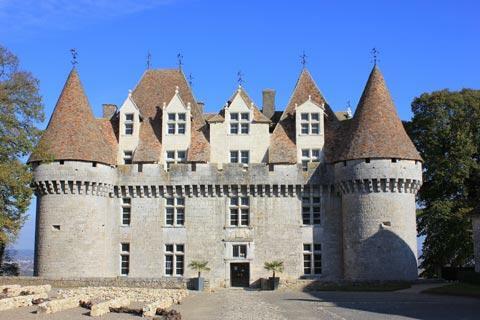 In fact it is more reminiscent of the castles you can see in the Loire Valley than those in the Dordogne department which are often older and with a clear military function. The round towers to each side remind us that this castle was also built with a military role, but the numerous windows with attractive stone surrounds as well as a roof that is very typical of houses in the region are decorative rather than military in design. 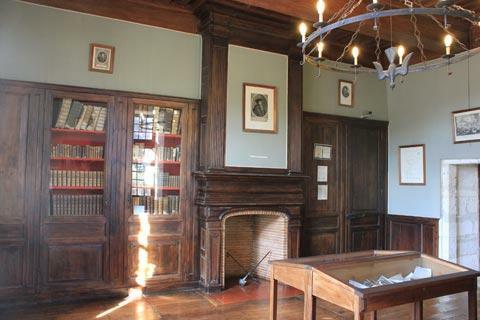 You can visit the inside of the chateau, and that is also in the Renaissance style with large fireplaces and wooden floors. 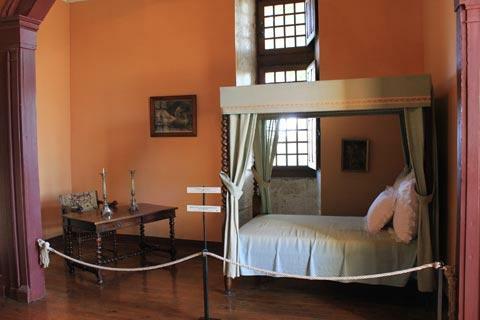 The visit includes rooms on three floors with a wide range of grand rooms to see. Several of these also follow a theme which adds interest to a visit. 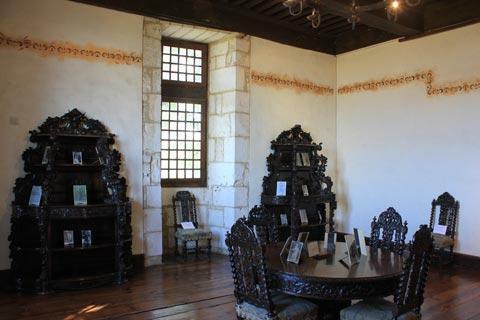 One large hall is decorated with furniture collected by Mounet Sully, a famous actor from Bergerac; another room features his collection of Limoges pottery; and another room features caricature drawings by SEM, a well known caricaturist from Perigueux. 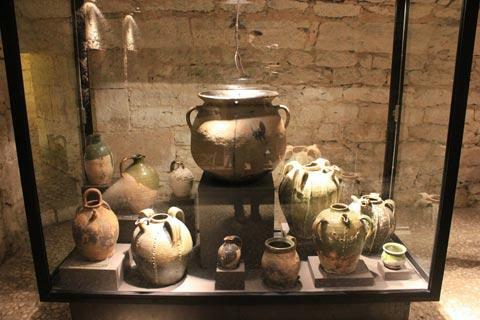 If you are a wine enthusiast you will also enjoy visiting the kitchens and the wine cellars in the basement of the Chateau de Monbazillac. 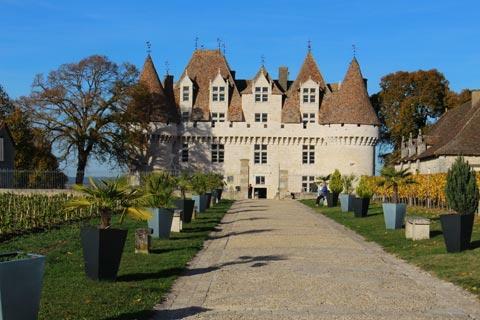 Not surprisingly you also have the opportunity to sample and buy the wines here at the chateau: Monbazillac wines, especially the white sweet dessert wine, are appreciated by connoisseurs all around the world. When you leave the castle spend some time strolling around the gardens and enjoying the views. Because of the raised position of the castle and village on the side of a hill there are lots of lovely views across the famous vineyards towards Bergerac and the north. There are several walks through the surrounding countryside that depart from here or from the small car park in the centre of Monbazillac. In fact the long Grande Randonnée* 6 (GR6) route crosses the village; the Grande Randonnée 636 is from Monbazillac to Lacapelle-Biron, a village in Lot-et-Garonne to the east of here; and the GR 654 passes through Monbazillac on its way between Bergerac and the Gers region to the south. So it is something of a crossroads for hikers! The picture here was taken in the last week of October. 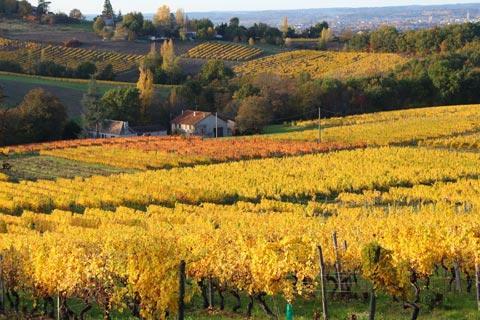 This is the best time to see the autumn colours when the vines are at their most beautiful but of course you also have a chance of cold and rain if you visit at this time of year. We live close by so can choose a nice day to cycle up to the castle! Cyclists will also find lots of country lanes in the area to explore. You should note perhaps that the quiet road (avoid the main busy road) between Bergerac and Monbazillac is also one of the longer, steeper hills to cycle up in the region but you get the reward of seeing the castle as you arrive! Castle enthusiasts can also visit the Chateau de Bridoire very close to here. 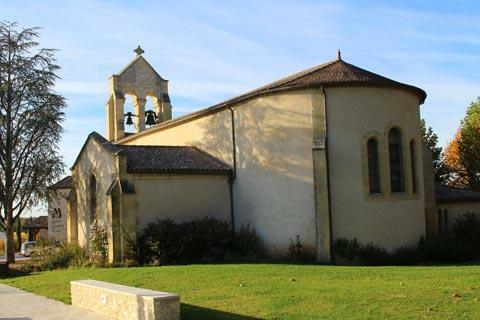 There are numerous towns and villages to enjoy in the south-west of the Dordogne department. 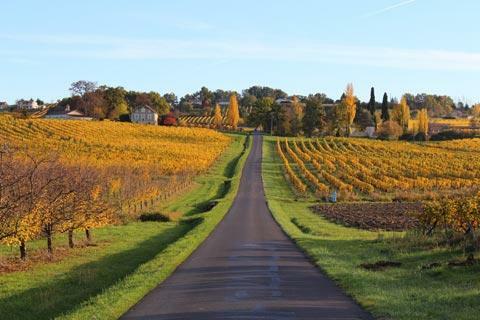 Our favourites close to Monbazillac include the historic centre of Bergerac, the ancient centre of Issigeac to the south-east and the bastide town of Eymet to the west of here.